Perfectly seasoned Salmon baked to perfection in 20 minutes. This healthy and nutritious dish is served with a side of asparagus or vegetables. 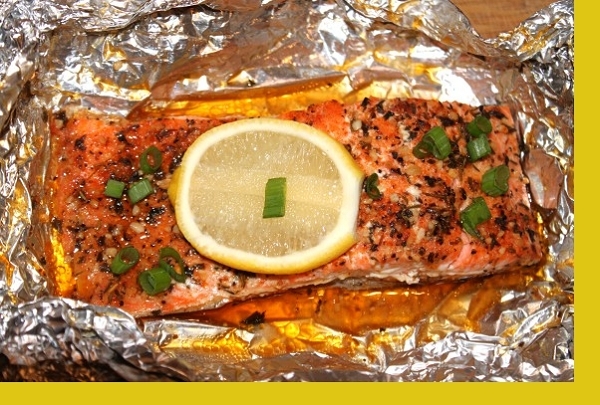 Enjoy this unique way of baking salmon in foil to keep the salmon moist and delicious while intriguing your family with its presentation. Be careful when opening the foil packs as steam will be very hot. 1. Preheat oven to 400 degrees. 2. Bake on lower rack for 20 minutes. 3. Serve with a side of vegetables. Of all the meals we have received this one was by far the best. The salmon was moist and flaky with a great flavor. Pretty picky fish eater. Liked the ease of foil packets (and fish skin stayed on foil). Great taste. Will re-order. The salmon packet was delicious. It doesn't get any easier than sticking a foil packet in the oven. 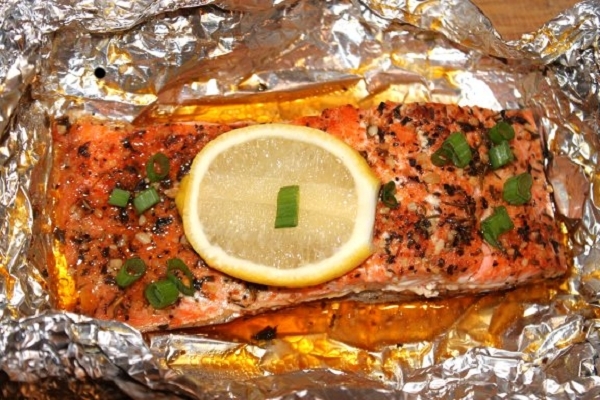 The flavor is fantastic, and the foil keeps the fish moist. Our one-year-old devoured it. So very moist and seasoned. Vegetables were baked with salmon but I should have used a little less dressing that was included. Directions did suggest doing that to reduce sodium content. Great meal with fresh bread. I always order the salmon packet. Never been a big fan of salmon until I tasted your dish. Love the seasoning and the hearty portion. Keep it comin' Maria! Loved the salmon packets. Fresh, high quality ingredients and wonderful flavor. This salmon packets were perfectly sized, and super easy to make. It also came with delicious vegetables and everyone loved it. Will order again for sure! salmon was very flaky. not sure what to do with the vegetables though as there were no directions. Maria: It was just a perfect dinner! Well spiced, moist and healthy. The price was very reasonable too! Thanks Maria, and are looking forward to our next dinner!